The anti slip style Ipe decking is a classic mode of all wood deckings. 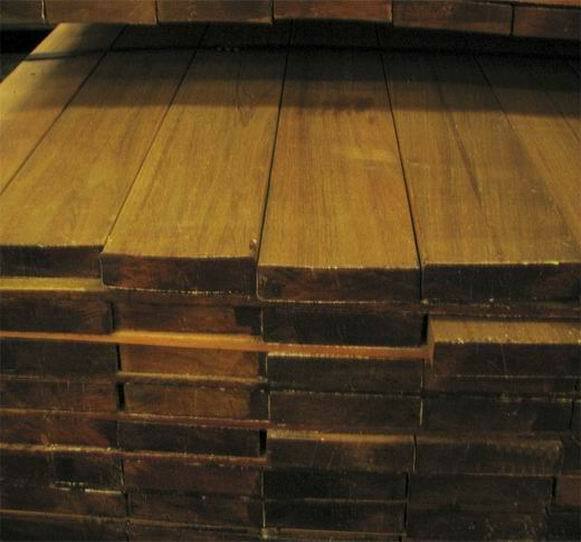 C&L hardwood in China supply the decking with selected & better Grade brazilian walnut (Ipe) timber.No sapwood and flaws like knots,splint are seen on the surface. The anti slip surface exterior use Ipe decking is advantageous after long time exposure to outside climate conditions as the imperfaction on the wood surface will be covered to some extent,on the other hand,it is safer to older people walking on it after fresh rain or snow storm because of its anti-slip function. C&L hardwood in China manufactuer 4/5" x 5-6" anti slip ipe exterior decking. Preferably, wood preservative oil with UV intibitors can be applied the wood deck surface to keep the natural colors and grains.You'll enjoy longer of natural brazilian walnut hardwood beauty.